Visit of Catacombs of the Capuchins and Monreale (with lunch). • h 10,00 meeting the agreed venue (hotel, airport, railway station, port ...) and departure for the convent of the Capuchins. 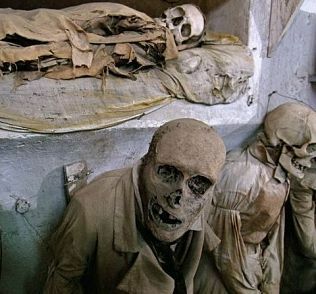 Guided tour of the Catacombs, in which reside the mummified bodies of more than 8.000 individuals between monks, priests, and members of the middle-upper middle class, who wanted to be embalmed second some techniques used to the age. The visit of the Catacombs of the Capuchins was always a must see , so as to be inserted in the already very popular Grand European Tour starting as early as the seventeenth century. 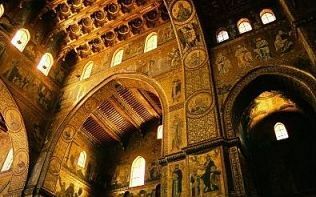 • h 11.15 departure to Monreale, visit of the Dom, majestic example of the Arab-Norman art in Sicily, visit of the Benedictine Cloister and the Belvedere to see a wonderful panorama of Palermo. •12.30 h return to Palermo for our typical lunch of sicilian dishes of quality, tasted in a private home, located in the heart of the historic center. • 15,00 h end of services. 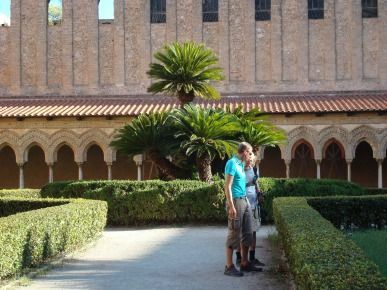 1. the tour includes: transportation by private car or minivan, guide in Italian / English language, tickets for Catacombs and Cloister of Monreale, typical lunch in a private house with traditional dishes of Palermo .